Hartlepool United’s players will be “fighting” for League Two places when Pools undertake two friendlies tonight. That is the message from Michael Woods ahead of matches at Guisborough Town and Seaham Red Star. After the scheduled friendly at Salford City collapsed, manager Craig Hignett decided to send two separate first team selections to these two Northern League outfits. 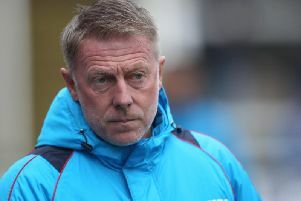 Thus far, to quote Hignett, he has “mixed and matched” his squad in the three friendlies, but wants each of his players to now get a full 90 minutes in. So one side will head to Seaham Town Park (kick-off 7.30pm) with the other venturing to the King George V ground (kick-off 7.45pm). “As a player you need a good pre-season under your belt, getting the minutes in the tank,” Woods told SportMail. “I think that’s why the gaffer has arranged two games on one night. “It would have been easier to have one with him overseeing it, but he wanted us to all get 90 minutes. “You can do all the training you want but nothing matches a competitive 90 minutes. Woods describes the games as “two cup finals” given the Ebac NL First Division sides will be desperate to impress against Football League opposition. But he says the Pools players have to “prove” themselves to Hignett and first-team coach Curtis Fleming if they are to line up against Colchester United a week on Saturday. “I know what these games are like,” said Woods. “I was in that position myself a few years ago after finding myself out of the pro game. “There will be players we are coming up against who have dropped out of academies and they have a point to prove. “The gaffer has said that the starting XI against Colchester is not picked yet, so we’re all fighting for places for that game. Hignett and Fleming have a very big squad to pore over – over 20 players have been given match-time in each of the friendlies. And Woods says that the players have been given no hints as to the XI to face Colchester from either their work in Durham or Tenerife or the various matches. “I think he is keeping us on our toes, we have a big squad and the gaffer has a lot of options,” said the midfielder, who came on for the second half of the 0-0 draw at Livingston on Saturday.